Fig. 6-19. 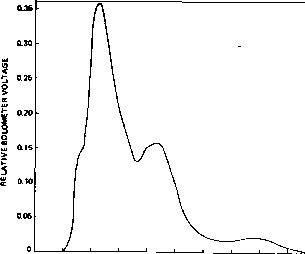 Horizon Location Errors Due to Radiance Variations and therefore avoid reflection problems such as those encountered on RAE-2 [Werking, el a!., 1974], Sun interference problems are also reduced in the infrared where the solar intensity is only 400 times that of the Earth, compared with 30,000 in the visible [Trudeau, el a!., 1970]. However, albedo sensors have some advantages over the infrared sensors, including lower cost, faster response time (microseconds for the photodiode employed by visible sensors versus milliseconds for the thermistor employed by many infrared sensors), and higher signal-to-noise ratio because the radiated intensity is highest in the visible (see Section 4.1). Attitude acquisition (see Section 19.5) frequently requires horizon detection far from the nominal mission orbit and attitude. Consequently, sensor versatility is a common design requirement. Wide FOV detectors, such as the two-axis Sun sensors described in Section 6.1. cannot accurately define the horizon of the large, relatively dim Earth. Consequently, horizon sensors frequently employ some means to scan the celestial sphere with a small, typically 2- by 2-deg FOV. Finally, Sun rejection capability is important for horizon sensors, particularly for those used for onboard control. Redundant sensors or optical systems are used to provide Sun rejection by comparing the output of spatially displaced optical systems. Alternatively, Sun rejection may be based on a priori knowledge of the Sun position, the sensor output pulsewidth or intensity, or the output of specialpurpose Sun sensors. Most horizon sensors consist of four basic components: a scanning mechanism, an opticaI system, a radiance detector. and signal processing electronics. They are normally categorized by the scanning mechanism or the method used to search the celestial sphere. Several methods are employed, the simplest of which is to rigidly attach the sensor to the body of a spinning spacecraft. For such body-mounted horizon sensors fixed at a selected angle relative to the spin axis, the FOV is typically a small circle or square of about 2-deg diameter, although a sensor consisting of two fan-shaped slits. 1- by 120-deg, was flown on the COS-B and ISEE-2 [Massart. 1974; Wetmore, et a!., 1976]. Wheel-mounted horizon sensors are similar to body-mounted sensors except that they are attached to the momentum wheel of a spacecraft and the wheel, rather than the spacecraft, provides the scanning motion. 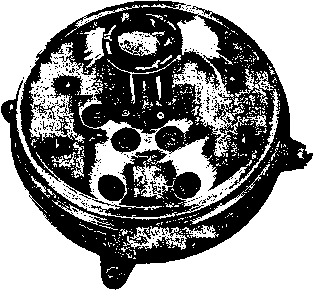 In contrast to the wheel-mounted horizon sensor, Scanwheels, a registered trademark of Ithaco, Inc., are integrated systems consisting of a momentum wheel, a horizon sensor, and electronics which may be used for both attitude determination and control (these are discussed further in Section 6.2.2). For spacecraft for which the angular momentum of a wheel-mounted sensor or Scanwheel is undesirable, designs employing a slowly rotating turret, such as the panoramic attitude sensor (PAS) flown on IUE and the ISEE-1; a rotating mirror, such as the nonspinning Earth sensor assembly flown on CTS;* or coiinterrotating scanwheels or wheel-mounted horizon sensors with zero net angular momentum may be used. For all horizon sensors, the sensor mounting angle, y, is defined as the angle between the spin and optical axes. * The original PAS flown on RAE-2 also employed a rotating mirror. The opticaI system of a horizon sensor consists of a filter to limit the observed spectral band and a lens to focus the target image on the radiance detector. Optical system components depend greatly on sensor design. In many cases, rotating mirrors or prisms are incorporated into the optical system to provide the scanning mechanism. The spectral sensitivity characteristics of the proposed SEASAT infrared Scanwheels built by Ithaco are illustrated in Fig. 6-20.